Map texture problem - is this a known bug? Topic: Map texture problem - is this a known bug? In producing the Gilf Kebir map, I came across a problem with texture mapping. I use the 4.09 version of Map Maker, and I am currently testing these maps on a lap-top, running 4.09 modact 2 [only], so this could be a 4.09 Modact problem perhaps?? [I say this because I never noticed the problem last year, when I was testing the same map on modded 4.12]. In map-making we typically use a modified FMB, thus operating in "excellent" mode - not "perfect" mode. One assumes though that the textures will be in exactly the same position, when we play on the finished product in perfect mode. But with the latest Gilf Kebir map, I've found that this is not true of all textures. The two screenshots below are from normal game play, in a test map where I've lined up all the map's textures on a flat bit of ground. The first shot is in excellent mode, the second in perfect. Note that 6, and only 6, of the 27 textures have changed tile alignments -see coloured circles. This seems very weird - and why only 6 ?? That puzzle is solved by looking at the load.ini. These 6 are the only ones with the lowest resolution, = -2. When I look in the Gilf Kebir map itself, there are many subtle foul-ups where these 6 textures have shifted [in perfect mode] - and they seem to be moved by half of one tile length, = 1.6km at the -2 resolution. Re: Map texture problem - is this a known bug? if no one else will - then I'll happily rely to my own post! First: to correct one thing above: As others have reported, the problem here is NOT limited to 4.09 [see MTO thread on this map]. Because we cannot use "perfect" mode in the Il2 map-maker [as I understand it? ], we must apply the map textures in "excellent" mode. One may take great care to do that, but alas: when you play the game in 'perfect" mode, some of those textures will have shifted, ruining the effect of the map, in many places. 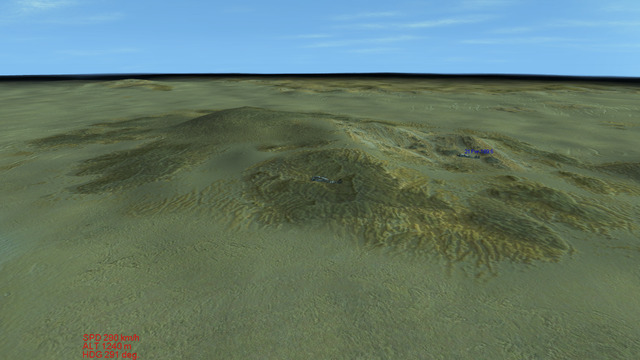 The two screenshots below give an "in flight" example, for a hill in grid BI 23, looking north. The shot with the red circles is "perfect" mode. 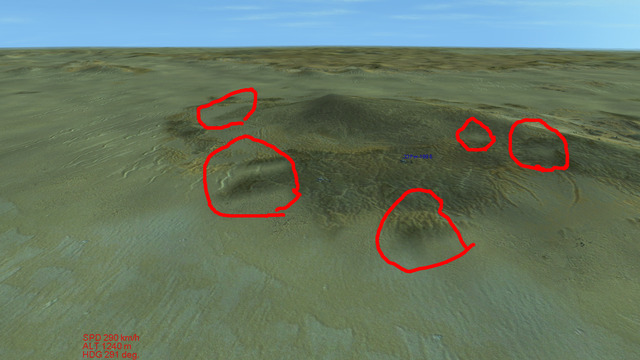 The circles show the ugly SNAFUs caused by the shifting of the MIDLAND3 texture, by about 1.6km. The other shot is "excellent" mode - which shows the same hill as the map maker intended. Thanks for pointing this out. It's an interesting discovery about the different resolutions. I have seen this before too - like on the BurmaLower maps - but never paid much attention to it. I'll be more aware of it from now on because it does screw up the look of things. For map making I have used "perfect" for a while but stopped because I was getting these sharpy/green spikes poking up (from the generated trees). Now I use slimmed down 4.12.2 SAS 5.30 where I do all my map making in "excellent", rivers look terribly ugly amongst other things. Once I am done, I push the changes to my CUP install (in "excellent") for testing airfields or checking the general look of it. I have noticed these shifts too but this is not too bad in my case, I have a limited number of "-2" textures, with all the textures for built-up area (fields, cities, villages, airfield) not using any resolution changes. This way I can get generated trees with the tree masks. So map making for me is in fact constantly swapping between "perfect" and "excellent". On the side, I don't really know how you can fly with any other settings than "excellent" with all due respect to those who have old rigs and cannot use anything other than "perfect". thanks guys for your helpful comments. Nice to know I'm not the only sufferer. and Zoran, you've solved the problem!!! the "spiky trees" : -that was just the clue I needed! why dont I see those lately? Answer is: I've been away from home for 5 months, & using my old laptop for map building, which doesnt allow perfect mode. I didnt think that would matter, until this "-2" problem arose. I'll just commandeer the wife's much better laptop, and go back to perfect mode! And I guess I'll have to stick to desert maps, where "spiky trees" are no serious problem. ... and also may be because deserts were created especially for you, so that you can apply your talent ...!